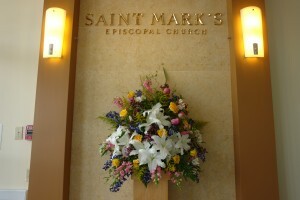 Saint Mark’s is a member of the Episcopal Church of the United States. Episcopal means having bishops who are the leaders of the church and spiritual descendants of the very first apostles of Christ. The Episcopal Church is part of the world-wide Anglican Communion which includes those churches derived from the Church of England. Saint Mark’s extends a cordial welcome to you to worship with us, and offers this introduction to the Episcopal Church and its ways. As you enter, you will notice an atmosphere of worship and reverence. Your eye is carried to the altar, or holy table, and to the cross. So our thoughts are taken at once to Christ and to God whose house the church is. On or near the altar there are candles to remind us that Christ is the “Light of the World.” Often there are flowers, to beautify God’s house and to recall the resurrection of Jesus. On one side at the front of the church, there is a lectern, or stand, for the proclamation of the Word; here the Scriptures are read. The sermon is preached from the pulpit on the opposite side of the church. Click here to tour the inside of the church via Google. In the pews you will find the Book of Common Prayer. It contains services for many occasions, and is the basis for the printed Order of Service which you received upon arrival. The large print is the actual service. The smaller print gives directions to ministers and people for conduct of the service. You may wonder when to stand or kneel. 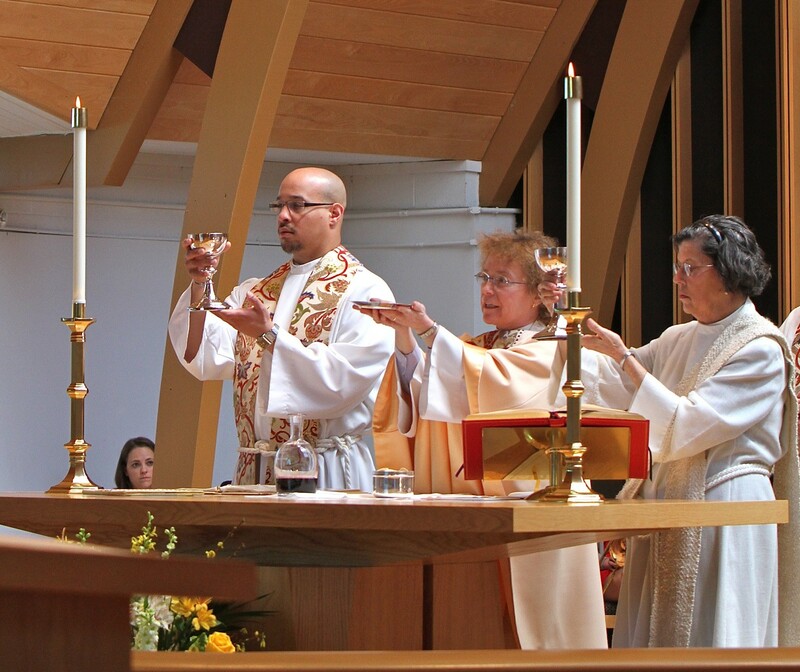 Practices vary, even among individual Episcopalians. The general rule is to stand to sing – hymns (found in the Hymnal in the pews) and other songs (many of them from the Holy Bible) called canticles or chants and printed as part of the service. We stand, too, to say our affirmation of faith, the Creed; and for the reading of the Gospel in the Holy Eucharist. Psalms are sung or said sitting or standing. We sit during readings from the Old Testament or New Testament Letters, the sermon, and the choir anthems. We stand or kneel for prayer to show our gratefulness to God for accepting us as children or as an act of humility before God. 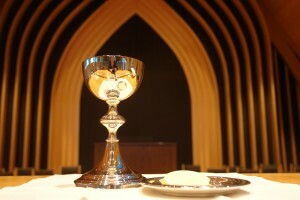 The principal service is the Holy Eucharist (Holy Communion). At Saint Mark’s it is celebrated twice each Sunday. The 8:00 Rite I (using formal, Elizabethan English) service is shorter, has less music, includes a sermon, and is followed by Christian Formation opportunities (September to May). The 10:30 Rite II (using contemporary English) service has more music (including choir from September to May), includes a sermon, and is followed by refreshments in the Parish Hall. Weekday celebrations also are frequently without music, and without sermon. 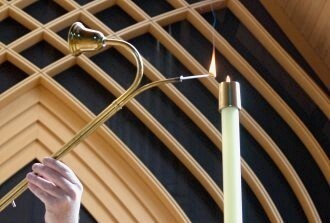 When celebrated at a later hour on Sundays, or on other great Christian days such as Christmas or Easter, music and a sermon are customary, and incense (a “solemn” liturgy) is occasionally used. One major celebration of each holiday is always without incense, in consideration of those who may be sensitive. All baptized persons are invited to receive Holy Communion in the Episcopal Church and those who are not baptized are invited to receive a blessing at the altar rail. Another service is Morning Prayer. The parallel evening service is Evening Prayer. These services consist of psalms, Bible readings, and prayers; and may include a sermon. Often these services are done in the English choral tradition with full choir. Several times each year worship takes place in the Taize tradition. Episcopalians do not talk in church before a service but use this time for personal meditation and devotions. At the end of the service (after the chancel party has processed out) some persons kneel for a private prayer before leaving. Others sometimes sit or stand to listen to the organ postlude, and others leave for fellowship while the organ is still playing. This is simply a matter of personal preference. It is not customary to applaud, however, as the music has been an offering to God and not a performance. To add to the beauty and festivity of the services, and to signify their special ministries, the clergy and other ministers wear vestments. Choir vestments usually consist of an undergown called a cassock (usually black) and a white, gathered overgown called a surplice. 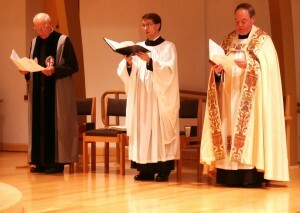 The clergy may also wear a cassock and surplice. Stoles, chasubles, and dalmatics, as well as altar coverings, are usually made of rich fabrics. Their color changes with the seasons and holy days of the Church Year. The most frequently used colors are white, red, violet, green, and sarum blue. We invite you to join Saint Mark’s community. We’re happy to answer your questions. Please let us know if you would like to become a member, if you are interested in baptism, or if you have other pastoral concerns. Click here for information on joining Saint Mark’s. 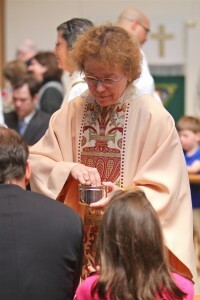 Learn about baptism at Saint Mark’s here. Click here to visit our Google Maps page.